Some 70 years ago, the late William Haines, who was a member of the Rotary Club of Cape Town, put up the first hut on his Glencairn farm, for use as a youth camp. William Haines was a great physical culturist, a physical training teacher at the South African College School. Haines had a great vision of training youth of all cultures in physical pursuits for the betterment of mind and body. When William Haines died on 15 February 1942, he bequeathed in his will, that his Glencairn property should be left to two organizations with whom he had many years of association. The smaller portion closer to the Glencairn beach was left to the Gordons Missionary Society. The larger section was left to the Rotary Club of Cape Town, with the instruction that a body be formed by the Rotary Club of Cape Town to administer this property. In 1948 the late General J.C.Smuts, then Prime Minister of South Africa, laid the foundation stone for the first Rotary Hostel which was named Smuts Hostel. This facility provides accommodation for 68 people. Soldiers returning from World War 2, through the MOTH organization, generously developed a second hostel, known as Moth Happy Haven on the site in 1952. This hostel is slightly smaller, but fulfils a similar purpose. Some years ago this hostel was handed over to the Rotary Camp Organisation by the Moth organization. In recognition of William Haines’ love of the outdoors, an open air camping ground, the Roberts Camp, was established. Here Scouts, Guides and similar users are able to pitch their tent or sleep in the open in a wooded area along the Elsje River. The have the use of toilets, showers with cold water and electric lights. The most recent development was Allan Jeffes Camp, named after a well known Wynberg Rotary Club member and founder of the Wynberg Rotors Club. This facility caters for 30 people. It was completed in 1989. The Rotary Camp Organisation manages the Rotary Youth Camps of Glencairn. The camp facilities are hired by Service Clubs, Welfare organisations, Youth Leadership groups, Religious groups, Schools, cultural groups and lately also groups catering for the handicapped. Around 2007 it was decided to put a permanent fence around a certain section of the Rotary property. This area that was fenced in, was around the area in which the camps were situated. I took these words from The Rotary Grace as a fit-fitting title for this newsletter. During the past twelve months many people helped us here in the Rotary Camps by serving, without expecting recognition. I would like to give them some recognition by telling you about them. For more than 10 years Louise Demjan, now an 80 year old lady comes into our camp to remove Duiweltjies(devil’s thorn). She started with 300 at a time, lately she stops at 50, that is now if we do not stop to talk to her and she loses count. Then we have Chrysalis Academy coming to help us with 15 people at a time for three Saturdays every three months with a new intake. They come to help me on Saturday mornings from 09:00 to 12:30, with the clearing of plants and dead branches from the river. A group of children from Ocean View helped Afri - Oceans on Wetlands Day. Navy personnel also helped to clear part of the river at a different occasion. 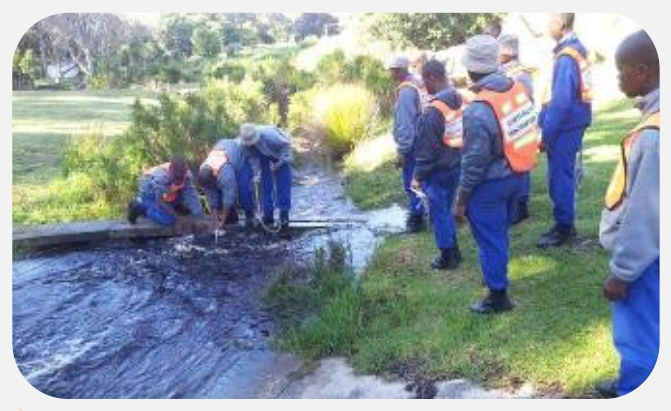 The City of Cape Town Invasive Species co-ordinator, Louise Stafford, had 15 people (mostly ladies) on our site to help to clear aliens for 10 days and they cleared a lot. We had Jean-Louis of Treefellas here with his huge woodchipper and for two days they chipped wood and branches in our camp for free. They also had specialists here, to cut down huge old and dead Pine trees. EMCE (every man can eat), a NGO, came to help with the moving of huge tree trunks. They helped for four days, working three hours per day. We also had the Paul Greyling Primary, Land Service club to help us to clear the forest of dead branches. One day a fire started on our grounds and when I got there, many of our neighbours were already busy trying to stop the fire. 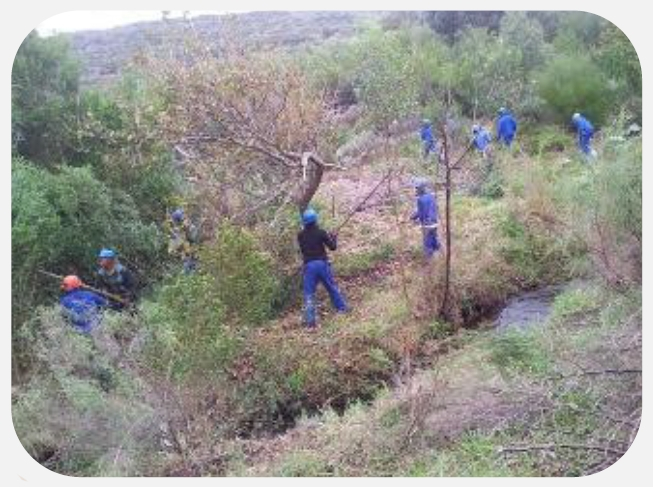 The Wildlife and Environmen-tal Society of South Africa with Mandy Noffke try to constantly improve water quality through riverine restoration also helped us. They received a Lotto grant which allowed them to send us 15 people to come and clear alien plants from our river for eleven days. The river between the Navy Sports Ground and the camp was heavily infested with Port Jackson, Rooikrans, Lantana, Wattle and Hakea. They cut, stacked the cut branches and trees and poisoned the stumps that remained. These were the big noticeable things where people gave energy, time and expertise and we are thankful to them.